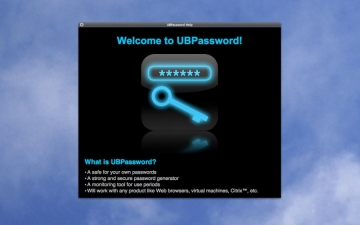 [無料] UBPassword Lite | Mac App Storeのアプリ検索・ランキング BuzzMac! - Will work with any product like Web browsers, virtual machines, Citrix™, etc. First of all, you need a “master password”. The master password is stored in your “Keychain” (remember the Keychain Access Application). A phrase is a text like “facebook™”, “ebay™” or “My holy company’s server”. For every password you need a describing phrase. An example: We want to have a secure password for our “ebay™” account. Open the phrase manager window (see screenshots) and add a new phrase. In the “Phrase” field enter “ebay” or something similar. Setup your password options, life time, etc. At this point you can decide to use your own well known password (“personal password”) or a very strong synthesized password (recommended). The personal password is easy to set up, just type it into the “personal password” field and check the button. The synthesized password can be generated in different styles: You can choose the length, the containing letter case, digits and symbols. Why is the synthesized password so strong? The password is generated using one of the strongest cipher algorithms (SHA, Secure Hash Algorithm) available today. Your master password and the phrase text are merged through the SHA-Code many times. Every previous SHA digest data is merged again into every scramble round. The new digest data is merged with the master password and the phrase again, and so on. This loop is performed until the length of the synthesized password is reached. 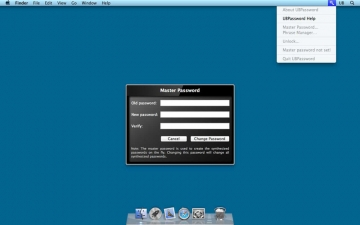 After creating the password, keystrokes are generated and send to the frontmost application. If required, an additional “Return” key is typed to complete the login. The selected use period is a simple notification mechanism how long a certain password is in use. UBPassword never will prevent you from using a password but it will show you a green/yellow/red timeout indicator. The synthesized passwords are never stored in any file on your disk. They are always generated the same way on demand (see above). The master password and the personal passwords are stored in your personal keychain (remember the “KeyChain Access” Application). You can retrieve them when opening the Keychain Access tool and investigate UBPassword’s items. To do that, you need your Mac OS X™ login password of course. If you have any problems with this application, please, feel free to contact us. This application contains some very complicated programming parts. The development team worked very hard to implement the algorithms carefully. We tested the app a long time before we published it but we cannot test every possible environment. If you find a bug, please let us know. We need your help to fix any problem as soon as possible. This version is limited up to two phrases (two passwords).